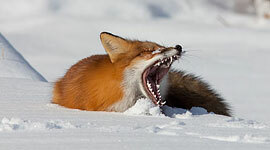 Beautiful dental work: up close and personal with a red fox, yawning from an afternoon nap in the sunlit snow. 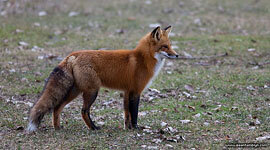 Putting to rest some of the fox controversy within the community: Ginger the cat goes after the fox. 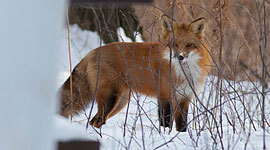 Ginger seemed genuinely curious, but the fox wouldn’t have any of it, and actually ran away. 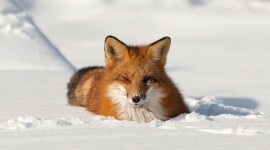 Cats 1, Foxes 0. Island cats rule. 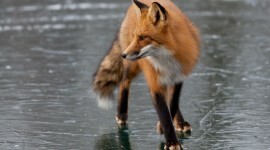 A gorgeous red fox steps into the sidelight on the hockey rink off of Algonquin Island, trademark reds on fine display on the black ice. An absolutely stunning red fox poses on the disc golf course, showing off its trademark tail that’s almost as long as its body.